A massive, feature-rich update - but is it too much? 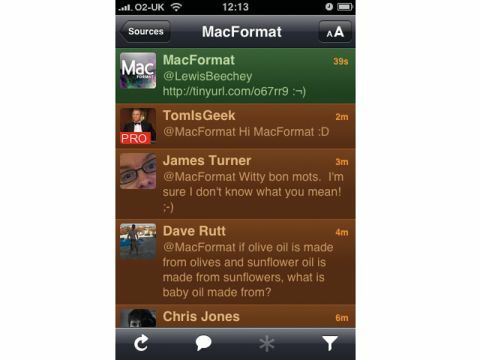 We were thrilled when the cuddly folk at The Iconfactory brought us Twitterific – the first proper iPhone Twitter client. But, recently, its simplicity in the face of burgeoning competition was beginning to hurt it. However, Twitterrific 2.0 has now arrived, and it has a radically beefed-up features list. At first glance, it looks less 'rich' and more 'complicated'. We recommend watching the 'tweetorials', in fact. Indeed some of the really cool and really basic stuff – conversation threading and even just profile lookups – need to be configured through the settings. The interface is lovely, though, and the Twitterrific model – your tweets, mentions, messages all in the same view, colour-coded – feels completely natural. If you wish, you can filter the list temporarily only to show favourites, mentions and more. And there's now finally the support for multiple accounts, trends and searches. After initial confusion, we're converts. There's little it can't do, although reposting between accounts is tricky. It has lots of little touches such as the ability to collapse the keyboard while composing a tweet to see the list, and even tap on hashtags and usernames to add them to your tweet. A complete joy to use.